Metropolitan Police officers will soon be able to use specially designed bags, known as spit hoods, to cover suspects’ heads during arrests and in police stations. The mesh bags are used to restrain suspects and protect the police from those who might try to bite or spit at them. The Met insists the hoods prevents exposure to diseases and serious infection. Spit hoods are not to be used on the streets initially, so as not to incense the public, but detail on their use after the pilot scheme expires has not been provided. The device may breach suspects’ rights, with some police chiefs suggesting the hoods resemble the trappings adopted at Guantanamo Bay. Even the Met was once opposed to them. “A spit hood is a primitive, cruel and degrading tool that inspires fear and anguish,” said Liberty director Martha Spurrier. “We have seen many cases where the police use them unnecessarily and without justification, including on children and disabled people. 'Spit hoods belong in horror stories, not on the streets of a civilised society.' Work a week as a cop in an inner city and come back to me. Deborah Coles from legal charity Inquest echoed the sentiment. “This is an alarming development with seemingly no debate or consultation and will do nothing to assist police and community relations,” she said. The Police Federation, however, thinks the measure is necessary to protect its rank-and-file officers. The risk of the hoods to arrestees, however, has been described as high by police monitoring groups. “Every new piece of kit is always justified on the grounds of officer safety,” Kevin Blowe from the Network for Police Monitoring (Netpol) told RT. “Yet again, there is no regard to the long history of violently misusing equipment against people with mental health issues and those who are routinely targeted by the police, particularly young people from minority communities. Human rights charity Amnesty International said in a statement: “Spit hoods can restrict breathing, create disorientation and can be dangerous and extremely distressing. Serious questions must be asked as to whether these restraints which have been criticized for breaching human rights guidelines should actually have a role in modern British policing. Until recently only smaller forces and the British Transport Police (BTP) used spit hoods. 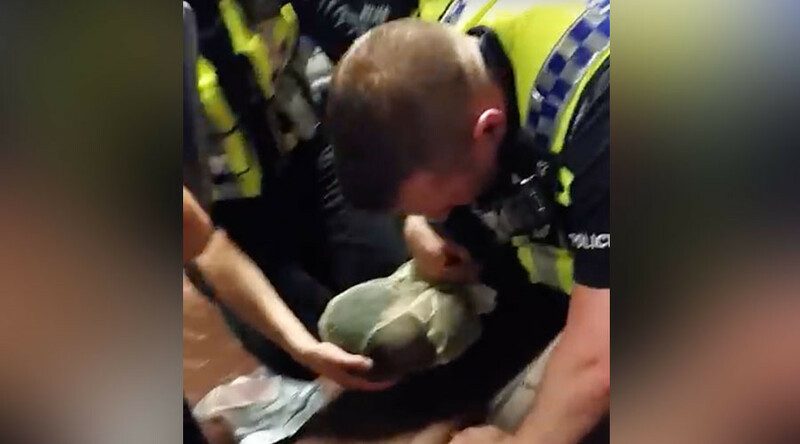 Recent footage of a young black man being arrested at London Bridge tube station, pinned to the floor and restrained in a spit hood, has landed the BTP in hot water. The recording, which was widely shared on social media, has led to the force being placed under investigation by the Independent Police Complaints Commission (IPCC).